Wow! Cool! Thank you for posting this! Hi there, how can one do this low-tech? What I mean is I won't have access to an atomizer arm or specialty plastics. I will, however, be able to use a fish tank, make saltwater, use water, get tempera paint, and I can make tons of stuff with PVC for very little money. I can also use a DSLR T2i camera to overcrank a bit. I know it's asking a lot, but I'm a huge fan of conventional special effects (despite digital). I was thinking I could use PVC and beverage tubing with a small, handheld pump to push paint into the tank. No need for high tech. Pour in in saltwater. Let it settle. As gently as possible pour in fresh water. Use large spoon or something to prevent the water from breaking into the salt water. Once it settles you can use a large syringe like those for glue or lab. attach 1/8 inch aquarium tubing taped to a bendable wire. Slowly push plunger and avoid going below the water split layer. 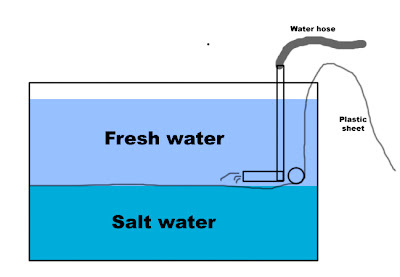 In case that wasn't clear just place something above the saltwater to diver the water to the sides instead of straight into the salt water. Slowly and gently in any case. Hey Scott, thanks for Posting this, its very helpful. One question, what does the pressure cooker do in this effect? Is it somehow beneficial to heat the paint? Pressure cooker not actually used with any heat. The point is to contain the paint and some amount of compressed air. The pressure cooker was modified with 2 holes and nozzles. One would be connected to a standard air compressor (like used for tools) the other nozzle had a brass tube that would go almost to the bottom of the pressure cooker and it also had an electronic value t allow liquid to flow through when it was energized. The pressure cooker was filled up to a certain level with paint and then it was pressurized with a compressor. The pressure cooker gauge read out the amount of pressure. When it was at the right pressure the compressor was turned off and the pressure cooker would keep the pressure. Now when the button was pressed on the atomic arm the valve would open on the pressure cooker. The paint was pushed by the pressurized air up the brass tube, through the valve and then down through the plastic tubing into the tank. The amount of pressure adjusted would control whether it rushed out or whether it dribbled out. Was wondering, was there a drain at the bottom of that thing, or did you guys place a pump in there to get all that water out? Also, do you think a big acrylic tank would work as well as a glass one? As I recall there was a drain at the bottom but it wasn't a thing I focused on. Acrylic - The problem with plastic is the scratches and the potential chromatic aberrations. I'm no aquarium expert so I'd suggest checking elsewhere for the various tradeoffs as well. 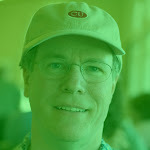 Hi Scott! Was wondering if you could elaborate a bit more on what/how you lit the clouds? Even better, if you were to do a "lo-tech" version of this today, what would you use? Waterproof LED's? Depends on the shot. 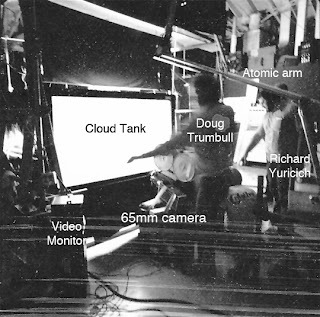 Many had standard movie lights outside the tank. If there as a light within the clouds then it was a fiber optic bundle (1/8 inch) that went down the same same tube as the paint. One advantage of the fiber optics is we had it go up to a special light source with a rotating glass wheel. By putting colored gels, ND filters on the glass or paint on the glass you could have the light change color, change intensity or flicker. Temperature of the water - We did some tests but it wasn't a huge deal. (i.e. room temp will work) We didn't refrigerate the water but cooler water tended to maintain the specific gravities longer without mixing and would tend to slow the paint dispersal. If salt water was warm then thermal action would try to move it up into the freshwater. If the temperature of the fresh water or paint was warm then it would tend to blend out quicker. Exactly the info that need for a still photo project shot with pentax 67. You don't need a pressure cooker with a compressor if you want to keep it lo budget, you can get a pressurised water sprayer from a garden centre. Just use the pump to pressurise and connect the aquarium tube to it. anyone knows about water tank effect. What is the Atomic arm? An atomic arm is something like a pantograph. It's a mechanical device that has a long tube 6-8 feet long, 3 inch diameter (measurements are guess at this point) and then a 3-4 foot pole that comes down each end. When you move one 'arm' up/down/left/right then the other end does the same thing. 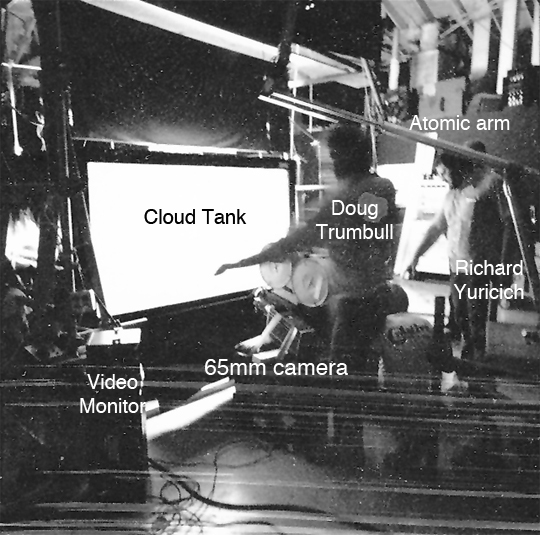 That way if Doug wanted to place clouds more to the left he simply moved his hand (holding on to one end of the atomic arm) to the left and the part that was in the water (the other end) would move to the left the same amount, as if he was standing in the tank. 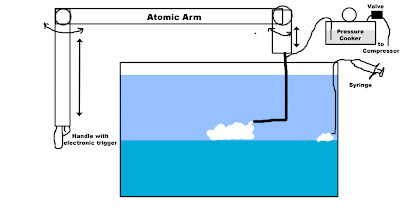 The term atomic arm comes from it's usage in atomic work where you had to move something that was radio active in a special container or room but didn't want to be exposed to radiation. They use the same devices for some biological experiments.